Swipe your finger inward from any screen’s right edge to fetch the Charms bar and then tap the Devices icon. Tap the Project icon to connect with an attached monitor, a TV, or a digital projector. PC Screen Only: This option recognizes the second monitor but keeps it blank, displaying only your Surface’s screen. It’s handy mostly when connecting to a projector at a meeting or conference. You can set up everything on your Surface without everybody having to see your busywork on the projector. Then, when you’re ready to wow the crowd, switch to one of the other modes, described next. Duplicate: Perhaps the easiest way to use two monitors, this option simply duplicates your Surface’s screen onto the second monitor or projector. It’s great for presentations, and it lets you control what you see on both screens. When your fingers touch the Surface, you see the effect on both screens. Extend: Meant mostly for office work, this option extends your Surface’s Desktop app across your second monitor, giving you an extra wide desktop. Or, you can keep the Start screen on your Surface and run your Windows desktop on the larger, second screen. Second Screen Only: This option blanks the Surface’s screen, sending the display only to your second monitor. It’s a simple way to connect a larger monitor, but you lose the benefits of your touchscreen tablet. Unless you’re trying to mimic a desktop computer, complete with a mouse and keyboard, use the Duplicate option instead. After you tap your choice, your Surface may blank its screen as it looks for and connects to the second screen. 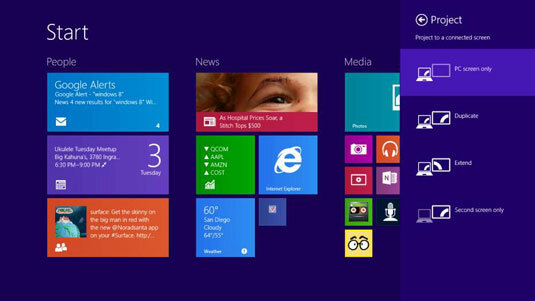 A moment later, your Surface’s screen appears on the second screen. When setting up the second monitor for the first time, choose the Duplicate option. That makes it a lot easier to see if your monitor is recognizing your Surface. Your Surface’s sound piggybacks along with its video through both an HDMI and a Mini DisplayPort cable. However, the sound plays through the speakers built into your monitor or TV set. If you want better sound, route the HDMI cable to your home stereo. Then have the stereo send the video to the monitor through a second HDMI cable. When you choose Extend, Windows makes the screen extend off your Surface’s right edge and onto the second monitor. To change that, visit the Desktop app’s Control Panel. There, in the Appearance and Personalization category’s Adjust Screen Resolution section, you can tell Windows which way to extend the desktop: left, right, up, or down. That same Adjust Screen Resolution section’s Detect and Identify buttons help you figure out which monitor is which. Then you can position the two screens to meet your needs. If you’re accustomed to using a mouse, the mouse-clickable corners on your Surface’s screen work on both monitors. Point and click in either monitor’s lower-left corner to fetch the Start menu, for example.